We’re seeing rising wages for the first time in two decades! ***Costs for goods, housing construction, food, fuel, and other important indicators are all seeing price inflation. We have a dovish Fed to boot… With slowing global growth, you can expect more monetary inflation to enter the world economy. Simply put, a global easing cycle is about to begin, as if that’s even possible with the current low and negative interest rate environment. Gold is trading at four-week highs and my next target for it is $1,360. Once this level is broken, I see a flood of capital entering this tiny market. When I spoke to Rick Rule last month, he cited that there are a lot of institutional players sitting on the sidelines. Once this capital begins to come in, in my opinion, gold will cut right through $1,374 and then leap higher with a raging bull market. The setup for gold here is as clean as it gets – you want to own gold right now, in my opinion. Gold shares are good for those looking to maximize their upside. Don’t allow your hard-earned savings to become a central bank experiment.Instead, own real assets, cash-flowing real estate, productive businesses, and gold. Dollar bills are a medium of exchange, but they aren’t real money, so remember that. 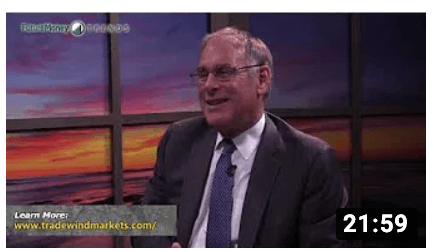 If you haven’t seen my recent interview with legendary gold investor Rick Rule, please make sure you watch it today.